I left this morning (Friday)for a 3 day excursion ending up in Virginia Beach, VA. Dealer visits Friday, Saturday a dealer open house/informal demo and Sunday the Capitol Cross Classic cyclocross race. This trip is the first test of the Element which I purchased last month with the intention of it being a more 'rep worthy' vehicle. As you can see below, it's pretty full. I completely removed the rear seats. This allowed me to fit in 5 bikes total. 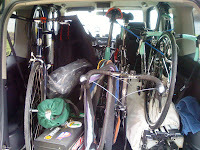 4 road bikes, 1 fixie, tool box, Bianchi Tent, bicycle repair stand, camping table, 1 pr rims, 1 frame, and a 'triathalon stand' for the bikes. I was netting 26mpg on the highway. Not bad for a vehicle with the aerodynamics of a toaster. Once I get my racks back on top this summer, I'll be able to get in all the bikes plus 3 on top and all the loose gear in the rear of the vehicle, up in the Rocketbox. Capacity running wild! The down side is that I got only 4 hours of sleep last night as I was up until 2am wrenching on the bikes to get them in top condition. Admist of all that prep, I knocked another 1/4lbs off my Bianchi SOK SRAM by installing a new stem and a carbon handle bar. Pictures to follow soon. "aerodynamics of a toaster".... you crack me up!